The olive trees growing alongside a Tuscany styled group of houses in our avenue are heavy with fruit. Walking past them a few weeks ago I imagined myself in an olive grove, finding it quite easy to get caught up in the romanticism of olives – they have such a rich history, and in modern times are being rediscovered for their many virtues and pleasures. “Olivesfromjordan” by en:User:Nickfraser – en:Image:Olivesfromjordan.jpg. Licensed under CC BY-SA 3.0 via Wikimedia Commons. “Armon Knossos P1060018” by Deror_avi – Own work. Licensed under CC BY-SA 3.0 via Wikimedia Commons. 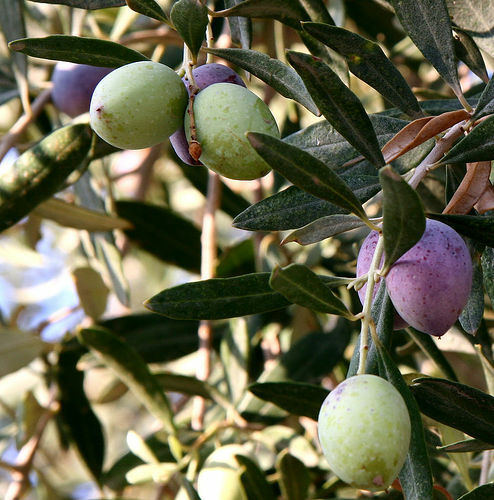 Although the use of olives has been recorded as long as 12,000 years ago, purposeful cultivation of the tree is thought to have only occurred around 6000 years ago, and grew alongside the early human civilizations of Persia, Greece, Crete, Rome, and Egypt. A symbol of peace and prosperity, fruitfulness and virtue, the olive occur in many of the world’s religions and stories. In Greek mythology the goddess Athena put forward the olive as ‘the most useful gift for humanity’, and olive trees sprang from the ground when the city of Athens was founded. An olive wreath was worn by brides and adorned those victorious in the Ancient Olympic Games. In the Christian Old Testament, most famously a dove brought back an olive branch to Noah on his ark as a symbol that the great flood was over. The olive tree is evergreen, and if left to its own can reach up to 10m. The trunks are gnarly and have slender grey fissured branches which bear leaves that are leathery, oval and green-grey with a silvery underside. Creamy white flowers in early summer are followed by green fruits which ripen to black in late autumn and winter. Olives and olive oil is probably best known as a foodstuff and is widely used around the globe, especially notable in the Mediterranean diet. Pickled Olives (unpalatable when picked) are popular as a condiment, relish, and to flavour food. The oil, which comes in various grades and methods of extraction, is used as a condiment, in sauces and marinades, and for cooking and frying.Medicinally olives, olive oil and olive leaf extract have become somewhat of a modern miracle medicine, and its popularity is growing. Olive oil (specifically virgin oil) is nourishing and rich in vitamins and antioxidants. It is often used to lower cholesterol and blood pressure, to help with circulatory diseases, and has a positive effect on the whole of the digestive tract. It is given as a safe laxative. It is great for use on dry skin and makes a very good base for liniments and ointments. Olive oil, especially with Rosemary, is a good treatment to revitalise dull and lifeless hair. Olive leaf can be infused and used as an antiseptic on cuts and grazes, and internally to lower blood pressure, ease anxiety and reduce fevers. The antioxidant, antiviral and antibacterial properties of olive leaf extract make it a popular natural medicine against the common cold, flu, herpes, arthritis, and skin diseases. Other uses include soap making, lighting and as a lubricant. The wood is used for furniture. Plants stabilise hillsides, and dyes of various colours are obtained from the fruits and leaves. This entry was posted in Plant Profiles and tagged olea europea, olive, olive leaf extract, olive oil. Bookmark the permalink.